School is nearly out for summer, but here at Taylor King Law, we never stop learning! Legal terms can be confusing and intimidating unless you have a law degree, but they don’t have to be. 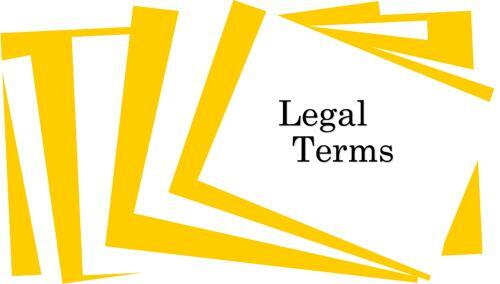 Brushing up on your legal vocabulary can give you more confidence and peace of mind when dealing with legal matters. Of course, there’s no substitute for the help of an experienced personal injury lawyer! We’re wrapping up our Tackling Legal Terms series with a recap. Be sure to visit each full-length article to learn more about these four common legal terms. A power of attorney is a document that gives a chosen person the power to act on your behalf in important legal matters. The person who creates the power of attorney decides what type of power the “agent” should have, and to what extent. Having a durable power of attorney is vital in a number of situations, from leaving the country to becoming mentally incapacitated and unable to make your own financial decisions. Each state in the United States has a set of laws known as “statutes of limitations.” These laws set the maximum time period that a person can wait before filing a lawsuit. Once this period of time, or “statutory limit,” has passed, the injured person can no longer file a claim or lawsuit related to the accident. Think of it as a deadline for filing a claim. In Arkansas, the statute of limitations for personal injury cases is 3 years from the date of the accident or the time when injuries were discovered. A lien is legally defined as the “legal claim that someone or something has on the property or funds of another person until a debt has been repaid.” In the context of a personal injury claim, your medical providers or insurance company may choose to file a lien to ensure that they are paid for their services once your settlement becomes final. A lien allows someone to “get in line” to receive compensation for the services or goods they’ve provided. If you have questions and need a lawyer – contact an attorney you can trust. The team at Taylor King Law has decades of experience and will ensure that you receive the answers you need and the care you deserve. With offices across Arkansas, we’ll be On Your Side, By Your Side. Begin your FREE, no-obligation consultation today by calling 1-800-227-9732 or submitting a case form on our website.